Condo in Terwillegar - Insuite Laundry - New Paint! Experience living in luxury, at an affordable price! This whole unit was just given a perfect and fresh coat of paint!! This stunning complex in South Terwillegar is beautifully maintained and offers extremely fast access to the Anthony Henday Ring Road! Within minutes find yourself immersed in the shopping and services amenities in the Currents at Windermere or the Market of Magrath. Plus Ester Starkman and Lillian Osbourne Schools are all in the neighborhood! Your ground floor level condo will take your breath away every time you open the door! Be greeted with a fantastic open concept layout and various types of flooring throughout the spacious unit. Plus there is a large storage closet off the front door, home to the laundry machines and built in shelves which means you will never run out of space! The large kitchen features gorgeous oak cabinets and is complete with beautiful stainless steel appliances including fridge, dishwasher, oven/stove and microwave. Not to mention there is a large kitchen island increasing the amount of cupboard and counter space you can enjoy! Off the kitchen enjoy a large dining space perfect for a kitchen/dining table. The large living room features carpet flooring and leads out to the ground floor patio, which means the whole space fills with natural lighting during the day! On the one side of the living room you'll find a large master bedroom with a gigantic walk through closet and a full bath en-suite!!! On the opposite side there is another large bedroom, another full bath and a linen closet! Water and Heat/Gas Included - Only Pay Power! One above ground parking stall included. Call to book an appointment to view your dream home today!! 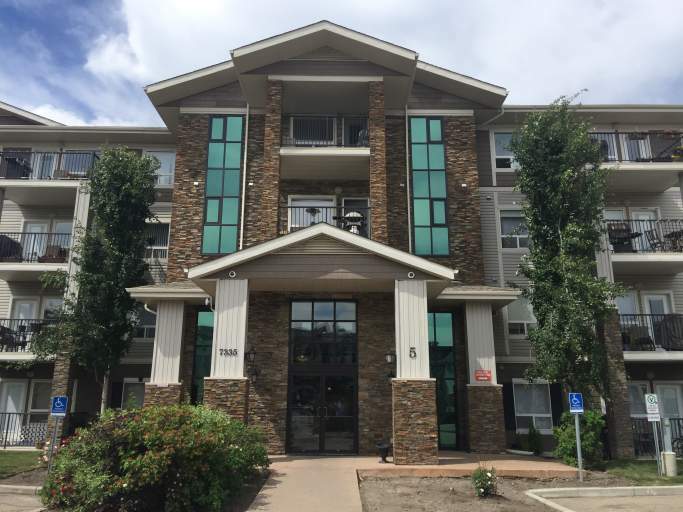 2 Bedroom Condo Availability - Condo in Terwillegar - Insuite Laundry - New Paint!